Nathan's - late night hotdog run. Ok, but not as good as . . . .
Madison Square Garden Concession Stand - hotdog with kraut about 4:00 Monday afternoon. Best hotdog ever, but I was possibly swayed by being so hungry. Blarney Stone Pub - bar food Monday night after manning the bench all day. Meeh. Cafe Mo Mo (or something like that) - Tuesday brunch. Nice little deli and grill around the corner from Hotel Penn. I had a great BLT and a black and white cookie. Laura had a good looking omelet. Folks who sat near us had some very tasty-looking burgers. And then - quite possibly the high point of the trip - we had dinner Tuesday evening at Perilla, the restaurant owned by Top Chef Season One winner Harold Dieterle. It is a small place in Greenwich Village, only about 2 miles from the Garden. We had checked out the menu ahead of time, and decided to do our own tasting menu of appetizers and sides. Our waiter was charming and helpful, finding a wine that Laura really liked and arranging our menu into courses. First course was a Lady Apple & Red Romaine Salad with maytag blue cheese & a spiced walnut vinaigrette and Seared Diver Sea Scallops with parsnip puree, pumpkin seed pralines & orange-hearts of palm salad. Next we had Spicy Duck Meatballs with mint cavatelli, water spinach, and a quail egg, Farro Risotto with artichoke confit, parmesan & chili-grape salad, and Sauteed Spaghetti Squash with garlic chives & marcona almonds. For dessert, we had the recommended Vanilla Scented Doughnuts with maple custard & chocolate chantilly and my favorite, Sticky Toffee Pudding with pomegranates & vanilla ice cream, and a wonderful cup of coffee that reminded me of the freshly roasted coffee I buy when we go to central Mexico. Every part of the dinner was wonderful. The food, the ambience, excellent service - I hope I get to back there next year! I love the look of your blog...NY sounds like it was fun! You really needed an up-top warning: DO NOT READ WHILE YOU ARE HUNGRY. This post made me run to the kitchen! It sounds like a delightful time. Mmmm...now I'm hungry. I love Top Chef! Sounds delightful. 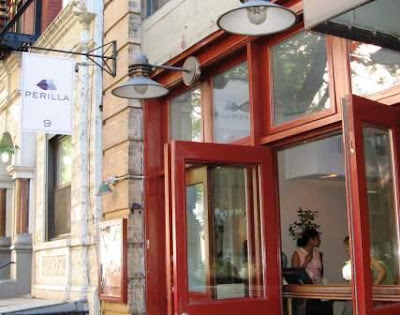 I went to Perilla once and am a top chef watcher - it's a great restaurant!